“Jothi” well known figure in Sri Lankan music industry. He sang hundreds of songs which inspired the film industry in early stages and still people whisper his songs. It doesn’t matter what your age, this person’s unique voice will attract you. 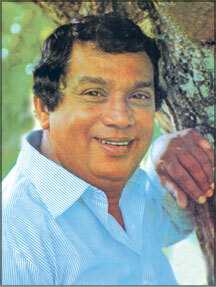 Hettiarachchige Reginald Jothipala (February 12, 1936 – July 7, 1987) was a prolific playback singer in the Sinhala cinema. His voice, style and songs are a blessing to the numerous listeners, who are musically inclined and could make a quote that none of those duplicated voices match the golden voice of this gifted singer.Jothipala rendered his voice to all classes of actors ranging from Eddie Jayamanne, Ananda Jayaratne, Gamini Fonseka, Vijaya Kumaratunga, Sanath Gunathilaka, Ravindra Randeniya and several others of young generation Actors in Sri Lanka. Deathless Jothipala was the undisputed choice in films that were made in the late sixties and through the seventies, the period during which he also began to act. Though Deathless Jothi was criticized for singing to the tunes of popular Hindi songs he also sang under the batons of Pandit W. D. Amaradeva, P.V. Nandasiri, Premasiri Khemadasa, Sarath Dassanayake and Milton Mallawarachchi. He sang in hundreds of films including popular hits like Kasthuri Suwanda, Thushara, Sweeep Ticket, Hitha Honda Minihek, Kawuda Raja, Hondata Hondai, Wasana, Sangeetha and others. The award-winning singer also played some memorable roles in films including Ethulweema Thahanam, Sulalitha Sobani, Sujeewa, Sukiri Kella, Abirahasa, Bonikka, Shanthi and his own production Sumithuro'and "Obai Mamai".